Welcome to The Abso!ute Sound online! We explore music and the reproduction of music in the home. We believe that the sound of music, unamplified, occurring in a real space is a philosophic absolute against which we may judge the performance of devices designed to reproduce music. Our goal is to provide the resources consumers need to judge how a component's sound either honors or departs from the music's truth, and to make sound purchasing decisions that maximize their experience of reproduced sound. 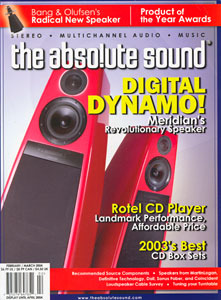 Below is our Issue 146, February / March 2004 table of contents and editorial. A special report by Neil Gader on Sonus Faber’s new factory and latest statement speaker. Wayne Garcia hot-rods his Rega with a bevy of cool aftermarket tweaks. Robert Harley looks at an entire system consisting of just one component and a pair of loudspeakers, with just two thin cables—neither of them analog—hooking it all together. Oh, and the user interface is in the speakers. The Absolute Sound’s writers and editors select the most intriguing audio products from the past year. Kevin Whitehead on one of jazz’s brilliant and underappreciated artists. 28 - Recommended Products: Digital and Analog Source Components. 38 - Editorial: your relationship with the high-end retailer. Paul Seydor and Neil Gader look at affordable models from Harmonic Technology, Kimber, MIT, Siltech, Synergistic Research, and Tara Labs. Read Alan Taffel’s findings on a very special CD spinner. Wayne Garcia reports on the latest refinements to ML’s ’stat-’n’-cone technology. A great speaker from a large, successful company? Why not? says Chris Martens. Sue Kraft finds synergy between this high-sensitivity speaker and unusual tube amp. High end from B&O? Read Neil Gader’s thoughts on this futuristic design. Though they aren’t yet well-known in the U.S., Robert E. Greene explains why these Danish DALIs should be. Curl up to the more than one hundred discs that are 2003’s best boxes, collections, and best-ofs—the foundations for any music library. Bob Gendron, Fred Kaplan, and Andrew Quint commit to print 2003's finest albums. Jonathan Valin on a classic (and difficult) love affair.